The Ultimate Cheat Sheet on Grass Fed Meat, Los Angeles! Here’s your quick summary about the benefits of grass fed meat, Los Angeles. 1. Grass fed meat is better for you. The meat from grass fed cattle has a better nutrition profile than its grain fed, factory farmed counterparts. 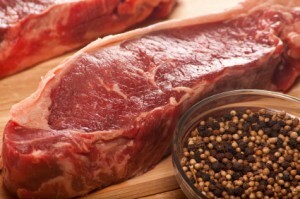 The meat has a higher level of healthy Omega3s and less of unhealthful Omega6s. It is also higher in CLAs and many important nutrients like Vitamin E, calcium, Magnesium, Potassium, beta-carotine and more. 2. Raising cattle on grass is better for the animals. When cattle eat the diet they were intended to eat – grass – their digestive tract is healthier and less likely to harbor harmful bacteria like E-Coli. The animals are happier roaming on pasture and not being confined to dirty, crowded feedlots. What animal wouldn’t prefer humane treatment? When cattle are living a clean and natural, unstressed life they seldom become ill and never need antibiotics. This is important because most of the antibiotics used in the United States go to feed animals. This overuse of antibiotics has created antibiotic resistant strains of bacteria which are threatening human health. 3. Grass fed meat is better for the planet. Feedlots are an environmental disaster. They create 100,000 metric tons of manure per minute worldwide. Disposal of these wastes without proper treatment leads to the pollution of water, algal blooms and acid rains. That is just one side effect of feedlots-other problems include soil degradation, water use and emissions. On the other hand, grass fed meat operations utilize manure in the fertilization of their pastures enriching the soils and increasing the grasses the cattle graze upon. Once you agree that grass fed meat is better for you, the animals and our planet, where do you find it? People living in urban areas often don’t have access to a local ranch with high quality grass fed meat. This is where Topline Foods can help. We source the highest quality grass fed meats including organic grass fed beef, organic free range chicken, wild caught seafood and more. You shop online and we ship to your door with very affordable rates in Los Angeles and all of Southern California. This entry was written by Jeff, posted on January 24, 2014 at 7:15 pm, filed under Announcements - Cities, Blog and tagged beef, CA, California, grass fed, Los Angeles, meat, organic. Bookmark the permalink. Follow any comments here with the RSS feed for this post. Both comments and trackbacks are currently closed.